Climate change is inevitable but we are not entirely helpless against it. As part of the Building Resilience project, WWF South Pacific are involved in mangrove protection and rehabilitation. Mangroves play a major role in the cultural and economic livelihoods of coastal communities in Fiji, and will be crucial in adapting to climate change in the South Pacific. Mangroves of Fiji are extremely important ecosystems and are among the better studied in the Pacific region. They provide ecological and environmental services such as protection of the coast from wave action and erosion, habitats and nursery grounds for coastal fisheries, trap sediment and pollutants to maintain the clarity of near shore waters, as well as playing a major role in the cultural and economic life of coastal communities (Thaman and Naikatini, 2003). Mangroves are well known to be vulnerable to climate change and sea level rise, and there is a strong possibility that the beneficial values of mangroves will be lost in the near future. There is a closer association between mangroves, seagrasses and coral reefs in island settings relative to continental margins (Linton and Warner, 2003). These ecosystems exist in a dynamic equilibrium influenced by contact with land; sediments and nutrients, carried by freshwater runoff are first filtered by coastal forests, then by mangrove wetlands and finally by seagrass beds. The existence of coral reefs is directly dependent on the buffering capacity of shoreward habitats that help create the oligotrophic (low nutrient) conditions under which coral reefs flourish, as these conditions limit algal growth which can threaten coral reef health. Coral reefs in turn buffer the soft sediment ecosystems shoreward from wave action. Mangroves are unique and important ecosystems which are often poorly appreciated for their ecological value. They act as a buffer between terrestrial and marine environments and as such they serve as an indicator of health for each of the adjoining environments. Mangroves provide connectivity between the terrestrial and the marine environments and support the perpetuation of biodiversity in natural ecosystems by facilitating the movement of species and providing niche habitats. They are also natural barriers and may prove to be an effective adaptive measure against storm surges, coastal erosion and higher tides associated with climate change and extreme weather events. 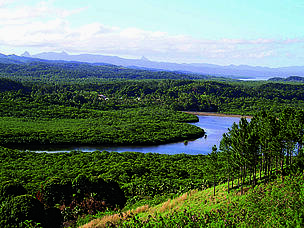 Fiji has the third largest mangrove area in the Pacific region. Climatic variation (windward-leeward effect) across the larger islands in Fiji influences mangrove distribution and ecology, and different locations are expected to experience distinct effects due to climate change. There will also be differences in the rate of sea level rise within Fiji as areas vary in the tectonic forces they are subject to, whether it be uplift or subsidence. In addition, the various mangrove areas on the mainland islands are experiencing different levels of impact and intensity from human development. These characteristics make mangroves especially important for coastal human communities and emphasise the need for greater efforts towards their management and protection on a national scale. Similarly to mangroves, coral reefs are impacted by changes in sea level and other events associated with climate change and extreme weather events, they play an important role as barriers, and are variably impacted by human development. In addition, coral reefs are threatened by increasing sea surface temperature due to global climate change. The interplay of ecological services found between mangroves and coral reefs, as well as the similar impacts noted above makes the pairing of adaptation strategies for both ecosystems a wise approach. 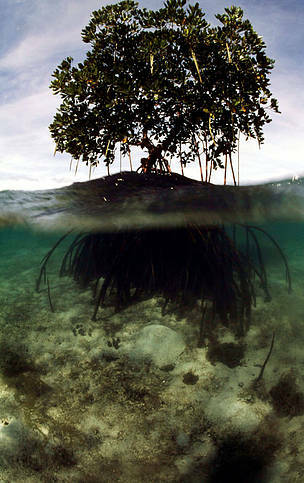 Mangroves build their own environment with their intricate root system that traps sediment. The roots' stabilising effect protects coastal areas from erosion and storm surges, especially during cyclones and extreme weather events. Mangroves act as a buffer between the land and sea, filtering out excess nutrient and sediment from rivers before they flow on to reef. A major threat to marine protected areas is sediment loading resulting from unsustainable agricultural practices. Therefore, the adaptation approaches for building coastal resilience of island ecosystems is linked to detrimental land based activities which must be addressed. The 'Building Resilience' project promotes the establishment and support of local Land Care groups, advocated through Fiji Ministry of Agriculture’s Land Use Planning Section in line with the government’s Rural Land Use Policy through the encouragement of sustainable farming approaches. The programme undertaken by the Land Use Planning Section currently contributes to Fiji’s commitments to the United Nations Convention to Combat Desertification (UNCCD) through Land Care groups that aim to mitigate loss of top soil, declining crop productivity and facilitating food security and poverty reduction through the agriculture sector. 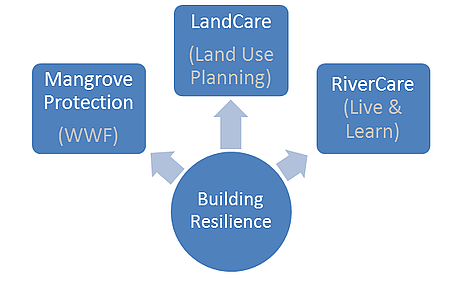 In ensuring that the collaborative adaptation approach is holistic and integrated, project efforts to focus on waterways and water sources within target sites involve Live and Learn Environment Education Fiji (LLEE). An element of Building of Resilience will enable LLEE to engage targeted communities with River Care and WASH (Water Health Sanitation Hygiene) activities. The project sites are located in the drier leeward sides of the main islands in Fiji for which this component will strengthen the target communities in adapting to water scarcity issues and ensure quality access through effective watershed and river-stream management. Such linked efforts to improve coastal protected areas management directly delivers on Fiji’s fourth adaptation priority on health by reducing target communities susceptibility to waterborne diseases induced by weather variability and extremes.